Virginia Baisden, a native of McIntosh County and U.S.C.G. 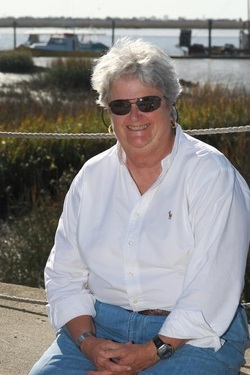 licensed boat captain, has spent much of her life exploring the salt marshes and waterways of coastal Georgia. She's been plying these waters for over fifty years and is a walking nautical chart. Her expertise in coastal history is complemented by a wide knowledge of the flora and fauna of local terrestrial and estuarine ecosytems since she holds B.S. and M.S. degrees in biology. In addition to her charter services, she has a wide range of experience in science, education, and research. She's an avid sportswoman, photographer, and nature lover. She's never met a stranger and enjoys sharing her love of the outdoors with others. Coastal Adventures of Georgia was founded in 1983. Captain Virginia Baisden offers boat explorations of Georgia's Barrier Islands, Marshes and Rivers. Clients who use her services include Nature Lovers, Birders, Hikers, Explorers, Artists, and Photographers.